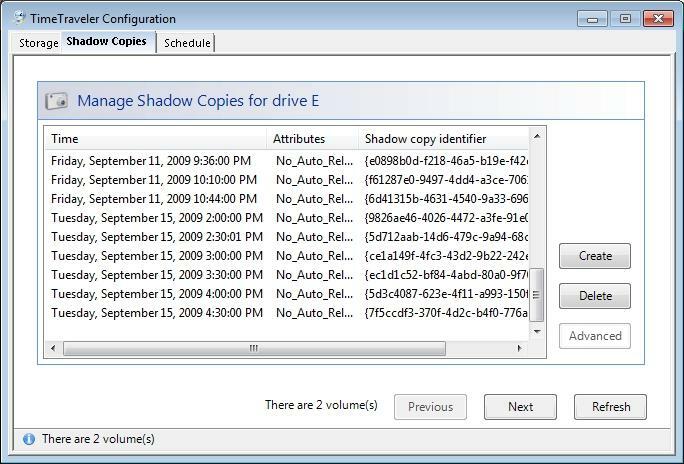 Configuration of Shadow Copies The configuration form allows you to configure Volume Shadow Copy Service (VSS) on each volume (hard disk) of your computer. You can open the form by clicking the blue button located to the right of the TimeTraveler timeline. The form shows information about the volume currently displayed in Windows Explorer. Other volume information is accessible by clicking the Next and Previous buttons. The volumes are individually configurable. The configuration form contains 3 tabs: Storage, Shadow Copies and Schedule. Figure 1 shows the Shadow Copies tab. It presents the current list of shadow copies on the volume. For each shadow copy the date and time, the attributes and the system identifier are displayed. You can create a new shadow copy or delete the currently selected shadow copy with the Create and Delete buttons respectively. 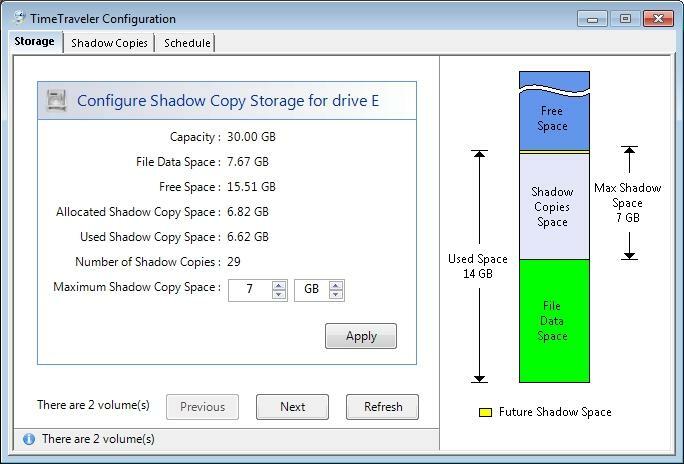 Configuration of Shadow Copies Figure 2 shows the storage tab. It lets you set the maximum storage space used for shadow copies. The graphic representation will help you visualize the volume space usage. Set the storage space large enough so you have the needed number of shadow copies. Microsoft recommends 15% of the total capacity of the disk. It is important to understand that new shadow copies displace old shadow copies when the total space used reaches the maximum you have allowed. In addition, if you have only a small amount of space left on your volume, you may run out of storage space altogether if you have a large allocation for shadow copies. After installation, a non-system volume does not have shadow copy storage associated with it. Therefore, the maximum shadow copy storage space displayed in the form will be zero. If you attempt to increase it, the associated storage will not be created and you will get an error message. But, pressing the Create button in the Shadow Copies page will create the shadow copy storage for the volume along with the first shadow copy. Once the shadow copy storage is created, you can configure its maximum storage to the desired value. A value of -1 means no limit. Configuration of Shadow Copies Figure 3 shows the Schedule tab. It allows you to configure one schedule per volume. A schedule has an interval defined in minutes, hours or days. A schedule can have start and stop dates. If no start date is specified then the schedule starts today. If no stop date is specified then the schedule runs indefinitely. A schedule interval specified in minutes or hours can have start and stop time. If no times are specified then the schedule runs all day. A day interval schedule has a start time. Implicitly a schedule starts at midnight on the start date and stops at 23:59:59 on the stop date. To create a schedule, select the interval using the radio button, set the parameters and then press the Apply button. To remove a schedule, select the 'None' radio button and press the Apply button. Configuration of Shadow Copies You will probably find that Windows has already created a number of Shadow Copies even before you installed TimeTraveler. These can be helpful if you need to look back to the time before your installation. 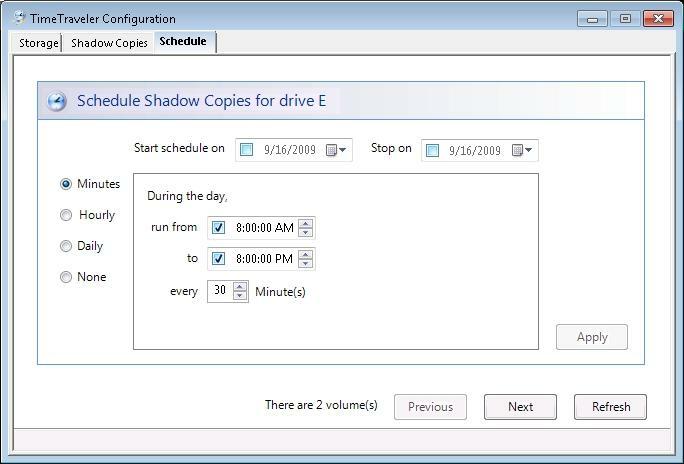 Even after you configure your own shadow copy schedule, you will probably still see a few extra copies that Windows adds on its own. It typically creates these before making changes to the system or part of the backup.